Live on a paradise island for free! Sign up for our Travel Like a Boss Army Mailing List to be informed when opportunities open! 8 Spots for a free internship, food and accommodation included! See the winners here! Koh Phangan, located in the heart of South East Asia and one of the most popular stops for backpackers, is the island of true yin and yang. Part hedonistic phangan party island climaxes with the largest music festival in the world, and part spiritual retreat that is marked by Kings, yogis and enlightened beings looking for fertile grounds to grow the seeds within their own souls. This magical island is now opening its doors to the next generation: location independent digital nomads looking for quality of life on an island paradise and using a laptop as a tool to make it happen. In Phangan this location independent laptop toting traveller finds a place to work, play, exercise, eat healthy and meet interesting like-minded people. Koh Space, the first co-working place on Koh Phangan, is now partnering with island resorts where marketing and technical support is needed. In return for 3 hours a day of your effort, we compensate you with a very nice room, laundry service and 2 meals a day - costs that are secured so that you can focus all of your energies. Imagine not having to worry about the day-to-day stresses so that you can use your brain to connect the dots and get more into your projects or the things that you want to do. This opportunity is designed to get people started on the digital nomad lifestyle or to assist those who are already living the lifestyle and want to extend their stay. It allows you the chance to work as a traveling entrepreneur but with a safety net for a 6-month period. After 3 hours of marketing on the internet for the hotel, you can spend the rest of your day doing what you like, giving you the freedom to find your true passion, engage in other projects, explore the island, get involved in island activities or just chill out and relax. What’s the catch? It’s not all just sipping coconuts and watching sunsets! You’ll need to be Internet savvy and skilled at marketing and creating bookings for the resorts while at the same time improving the image of the resort and of the town. This could include, but is not limited to connecting with, travel agencies, internet booking systems, Facebook groups, conferences, sporting events, etc. Create a monthly customer happiness report compiled from reviews on Trip Advisor, Agoda, etc. If you want to bootstrap and work on your own business in the afternoons while networking and learning the basics of being a marketing manager and social media expert for hotels and resorts. Build up a resorts web and social media presence in the mornings while working on your bootstrapped business in the afternoons! Write a book, start a blog, record a podcast, or start a dropshipping store! Internships will start June/July and End Mid December! 9:00-9:30 - Meet at KohSpace for a daily meeting with the other interns and/or team lead. 9:30-10:30 - Work on the project for the day, which may include writing a blog post about activities around Koh Phangan: ie Scuba Diving, Yoga, Natural Health, Beach Life, Family Holiday, etc. 10:30-11:30 - Post on social media, photos and articles for the day. 1:00pm - 4:00pm - Work on your own projects, whether it be your dropshipping store, blog, website or whatever you are working on. 4:00pm - 6:00pm - Go play beach volleyball, lay on the beach and read a book, go for a swim, practice Muay Thai or go to the gym. Rest day. Lay in a hammock, go scuba diving, go hiking or explore the island with the other interns. Know the basics of On Page SEO for blogging, and youtube videos. Know the basics of Affiliate marketing for links to Agoda, etc. Koh Phangan has a wild party known as the Full Moon Party every month. Even though you're welcome to attend the party, you need to be responsible, especially since it lasts for 1 entire week every single month. The week of the Full Moon party isn't an excuse to miss work or come in hungover. You'll need to balance your work/social schedule. If you’re not the type of person who goes with the flow, is open to new cultures, is self-motivated, works independently and is not agitated when things are not always at Western standards, then this might not be the job for you. But, if you are that kind of person then this might be one of the most rewarding experiences you’ve had! Kayaking, Hiking and Discounts for other activities like Scuba Diving. Intensive online marketing and ultimately more bookings. The deal extends for 6 months. For people who do great work and want to stay longer, this can be an option to be discussed toward the end of the first term. Applications Close June 10th 2015! 1. Create a 3 minute video explaining your skills set and why you think you would be perfect fit for this opportunity. Introduce yourself and tell us a bit about who you are. Talk about why this project appeals to you. Talk about your experience with the Internet, marketing, social media and other related topics. Mention any other skills you have that would be useful such as photography, videos, or anything else. That's it! The guys at KohSpace will select eight people for this opportunity. It is completely free for you, is a fantastic way to network, bootstrap your business, learn or improve your internet marketing and social media skills and meet a bunch of new friends. Apply today as even though this internship may be on going, the guys at KohSpace are excited and want to start right away. Whether you are already in Thailand or plan on coming within the next 4-8 weeks, this is a perfect chance. Subscribe to the Travel Like a Boss Podcast using the Podcast app on your iPhone or the Stitcher App on your Android. 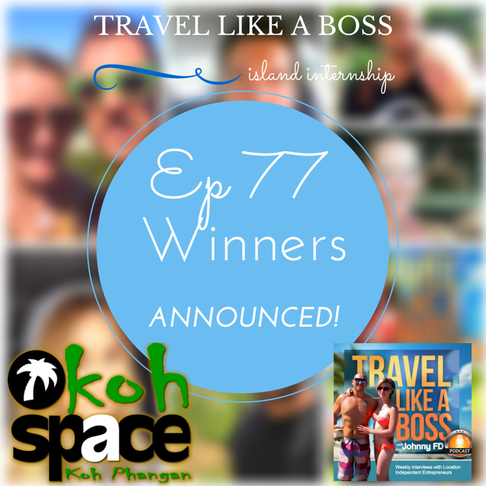 In Episode 74, I interview Charlie, the owner of KohSpace and talk about life on Koh Phangan, the internship, why he started the coworking space, and an FAQ on what the internship involves. When the owner of KohSpace came to me with this idea, I instantly loved it. I wish that I had an opportunity like this when I was first getting started with my online business. I will still be based in Chiang Mai, but will be traveling down to Koh Phangan during the 6 month internship for 2-3 weeks at a time to meet everyone, lead the morning strategy meetings and hang out. You will be working under KohSpace, i'm just helping out. If you are looking for a way to live for free, network with some cool people and enjoy the island life while having afternoons to work on your own business, whether it be a blog, book or dropshipping store, this is a no brainer. Apply today and best of luck! If you are wondering what business to build in your afternoons off and want to have a successful online business that replaces your 9-5 income, I would highly suggest either starting a dropshipping store or building a following on your blog. Charlie, the brains behind this idea, asked me to get involved and help spread the word to make this program a success. I also plan to come down to visit and meet you all. I love Koh Phangan and have visited the island around ten times since 2004. A little over a year ago, I sold my business in the US and made the leap of faith to finally move to Thailand. I see this program as an opportunity to help other people make that exact same leap to living in a beautiful place, and providing them the support and the time to work on their own projects. Rather than sitting alone in your basement working on your online endeavors (that was me only 16 months ago), you'll be in a tropical paradise learning from other smart people who have the guts to make their dream a reality! If you're wondering who I am, I'm the admin of the Chiang Mai Digital Nomads Facebook group, creator of the personal development board game "Better Me", and Host of the OD on Life podcast. 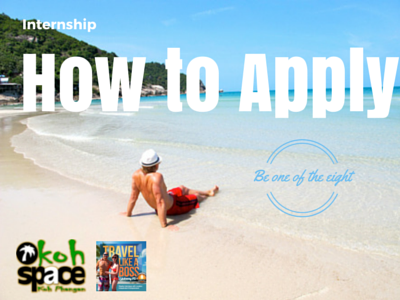 Koh Space hopes this Internship program can be an inspiring & enjoyable project. It’s our mission to pass all the lessons we have learned while living abroad to people who are looking to do the same thing themselves. Creating a team of likeminded people who want to unplug and become location independent and more importantly, live a high quality, balanced life on a tropical island! Good luck to all the applicants and much appreciation to everybody involved. This project has a good vibe to it, lets keep it fresh and fun! I've always had the travel bug in me, wanting to explore and adventure into new exciting places. So backpacking through Southeast Asia, I came upon Koh Phangan, my paradise. From the white powder sand beaches to the green palm tree jungle hikes...who wouldn't fall in love? After given the opportunity to build an online marketing business that allowed me to continue to live in that paradise and also be apart of a community working together as a team, it was a no brainer decision. I strongly recommend this internship to anyone out there who wants to experience island living and build valuable skills in the process. Q: Will you have your own room or is it shared? A: You'll have your own private room with bathroom! Q: What type of hotel will it be...a cheap guest house or better? A: It'll be a good resort, most likely a 3 star hotel with a pool. Q: I was curious if the "guidance with your business" aspect of the internship is like a mentorship program? Also if this guidance is a one time ordeal on an ongoing process? A: This is not a mentorship, this is an work/live internship where you will be given tasks and basic guidance on what to do in exchange for doing 3 hour of work per day for the resort. However, you will also learn a lot from each other, and access to people who may potentially want to mentor. If you want guidance on your own side business, that you'll have plenty of time to work on in the afternoons, I would suggest signing up for Earnest Affiliate or Anton's Drop Shipping Method. Q: I was wondering if there is any way to get more meals throughout the day in exchange for more work? A: I would suggest budgeting an extra $200 per month for your own expenses. Dinner can be had for less than 100 baht ($3.00US) In your afternoons off, you can always freelance if you need extra money. Check out Freelancer.com and oDesk.com or even Fiverr.com for part time gigs.